These Rules are to be read in conjunction with the Policy Handbook for CTC Member Groups and in the case of conflict the latter will apply. 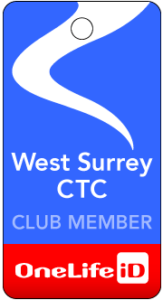 The name of the Group shall be the “West Surrey CTC” hereinafter referred to as the “Group”. Members of the Group shall comprise CTC members in such defined groups or geographical area as the Group Committee and the CTC together may determine from time to time. a) to assist CTC members to meet and join in cycling activities organised and led by the Group and to help promote the policies and objectives of the CTC generally. b) to conduct its activities free of charge except for such costs as may be appropriate for specific activities, events or publications. a) The Group’s activities shall be managed by the Group Committee and its elected officers. b) The Group’s activities may be carried on by any informal group or groups whom the Group Committee shall from time to time agree may operate under its over- arching management and financial responsibility on the understanding that no activity conducted by such informal group(s) shall place the Group or its Committee in breach of these Rules or the policies and objectives of the CTC generally. b) The Chairman, Secretary, Treasurer, Rides Secretary and other members of the Committee shall be elected at the Annual General Meeting. c) The Committee may fill casual vacancies and may appoint such sub-committees and delegate thereto such of its powers as it may decide from time to time. d) The CTC Councilor responsible for the area or activity covered by the Group shall be entitled to attend any meetings of the Committee but shall not be entitled to vote thereat. e) A quorum for any meeting of the Committee shall be formed when not less than three members, of which one is the Chairman or Secretary, are present. a) The duties of the Chairman shall be to preside at each meeting of the Committee and at the Annual General Meeting and to facilitate the efficient and correct conduct of the meeting as laid out in these Rules. i) to receive and, if approved, adopt the Annual Report and Statement of Accounts. ii) to elect members of the Group Committee and an honorary auditor who shall not be a member of the Committee. All nominations must be in writing, bearing the names and signatures of the nominee, proposer and seconder, all of whom must be CTC members attached to the Group. If insufficient nominations are received prior to the Meeting then nominations may be taken from the floor. In the event of a contest an election shall be determined by ballot of those present at the Meeting. iii) to elect a President (whose election shall be for a period of not more than five years) and not more than five Vice Presidents, if any , in recognition of special or outstanding contribution to the Group but whose positions per se shall be entirely honorary and have no formal duties. iv) to consider any notices of motions which shall have been submitted by members in writing to the Group Secretary at least 14 days before the meeting. ii) on receipt by the Group Secretary of a written request signed by at least ten members of the Group. Notice of a special general meeting shall be published in the issue of “Cycle” published in one of the two months before the date of the meeting. The notice shall state the business for which the meeting is called. No business other than that stated in the notice may be transacted. Any business done at a general meeting with less than ten members present shall be subject to ratification by the CTC Council.